Order - Destroy this event to begin an engagement involving your ship. That ship is Weapons +1. If you win, score 10 points. 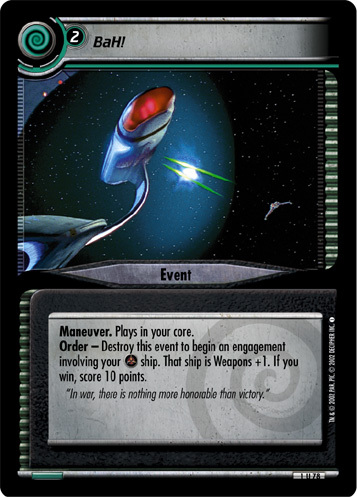 Characteristics: engagement, score points, enhance your WEAPONS (other cards), plays in your core, Maneuver, ship related card. There are 12 entries for BaH! (ST2E 1 U 78) at the Tradeplace (10 haves and 10 wants). Click here to see all trade list entries for this Uncommon card!